Overview: Meet the most beloved sitcom horse of the 90s - 20 years later. 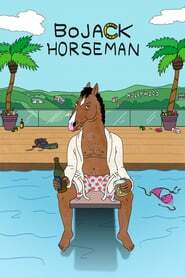 BoJack Horseman was the star of the hit TV show "Horsin' Around," but today he's washed up, living in Hollywood, complaining about everything, and wearing colorful sweaters. I watched the first episode. It's one of those shows that's funny but not enough to make me laugh regularly - it's almost too predictable given the character setup. After I figured out the character stereotypes, the only thing that actually did make me laugh a bit was the cotton candy. It's almost too smart/witty more than it is strictly funny. I might watch some more when I get bored, though. It has some potential, I'd think of it as (level wise, not content wise) a sort of cartoon Frasier or Archer with less funny and less outrageous situations. I thought this was a comedy, but apparently it's an angsty rom-com, like How I Met Your Mother, only with just Ted and none of the other cast. Didn't hate it, but failed to deliver the lols. Some of the episodes are hit or miss and I rarely laugh more than once or twice each, if that, but I still enjoy watching it and find it fairly entertaining; it also reminds me a little bit of Duckman which is a plus. Just watches the whole season in two days. Good stuff. The backround jokes are what make me laugh the most. The story and main characters are witty and clever. Stoked for season 2. Can't wait for Astrocreep's review. Is this about Bo Jackson? Not bad. If you're expecting nonstop laughs move on, but I found it enjoyable...while drinking. I finished the season. It was OK. Very Archer-esque in a lot of ways (top shelf philosophy/literature/art jokes, reintroducing random jokes as inside jokes later, etc.) but ultimately it just left me wanting to watch more Archer. I feel very few episodes had the right balance, most of the time when you need story there's too much slapstick or retarded plot twists and when you need a joke there's just a few thoughtful lines and the scene ends. I think the second season could be a lot better since they were going back and forth a lot in this season. That said there were definitely a few really good laughs, just not a lot of them. This feels like a ripoff of Mission Hill almost through and through but without the Mr. Show writing alumni to back up the odd characters. It has a great cast and good animation but it feels like everyone is completely out of their element. Amy Sedaris feels completely wasted. This show seems like what would happen if an executive decided that the kids like Aqua Teen Hunger Force and Tim & Eric, intentionally wrote something that wasn't funny to match the anti-humor and then cast a bunch of big names in it to sell it to Netflix. This show is Archer season 5 if they didn't even come up with a premise as temporarily funny as Pam does cocaine. Who wants a TAL Ira Glass ringtone? Wasn't bad. It went from funny to dark at the end but I have no regrets after watching it. not really finding it amusing at all. LEMUR ON FIRE LEMUR ON FIRE !! Some background jokes were really fun, otherwise the main plot is too rom com for my tastes.